It feels like Graspable may be more valuable if it connected the algebraic with a visual model of equation solving. But I’m not convinced that would be better than going low tech and just pulling out the Dixie cups and counters. Did you feel the same way about AlgebraTouch’s approach to solving equations? I really liked AlgebraTouch because I felt that it could teach better than any other tool the skill of sequencing algebraic steps. I’m not yet sold on graspable because it seems to have a much higher learning curve than other tools. Hi Aaron, I’m afraid I don’t have a lot of experience with AlgebraTouch. I remember feeling conflicted about how easily I could make things happen without thinking about them. Tap or drag anywhere, even thoughtlessly, and something would happen. Perhaps that was by design, though. I can appreciate yours and Tony Riehl’s sentiment that programs like Graspable Math and AlgebraTouch de-emphasize a most of the fundamental properties of Algebra. But I think what is gained is incredible: for the first time in mathematics education history we gain a way to teach the laws of Algebra in a truly exploratory way, the way 3 year-olds learn how to use an iPhone. We can give kids a tool and ask them “what patterns do you notice?” and then generalize student results, refining them into the properties of Algebra. We can start with a puzzle and discover the laws and properties. No where else can you do that. AlgebraTouch was phenomenal for doing these kinds of discovery activities. I’m not sure that Graspable Math is user friendly enough to not get bogged down in user mechanics, but still trying it out. Thanks for this. Based on this post and the comments surrounding how the app treats solving equations, I think I’m going to go so far as to stop using any kind of metaphor related to movement or even isolation while talking about solving equations. I used to teach how adding or subtracting a number from both sides of an equal sign keeps the solution the same, and that we do so *in service* of moving numbers and variables to ultimately isolate the variable. Next fall, I’ll try framing solving equations as a process of rebalancing up until the point that the solution becomes intuitive. For example, if you can immediately see that -5 makes 2x – 3 = 4x + 7 true, then so be it. Otherwise, rebalance the equation into 2x = 4x + 10 (or whatever) to see if you can spot the solution then. If not, keep going until you can. I agree with much of what you have said but there are some features I do like here. For example, I like the Scrub feature to show how changing one value affects the chain of manipulations in real time. But beyond that, whenever I see tech like this emerge (another example is Photomath), I ask people: “Given that this now exists, how does this change how you value things like solving equations in your class?” That is, If a student can just drag stuff around (with Graspable) or take a picture (with Photomath) does that diminish the importance of teaching methods for solving equations? Don’t get me wrong here, I think that algebraic thinking is hugely important for students but solving equations may not be. I’ll take that to it’s logical (or illogical) conclusion: does it matter at all what we teach students? Like is it the end of the world if someone doesn’t ever learn the quadratic equation or how to calculate slope? Most of the content that we teach (not just in math) is just stuff and is only useful (the individual tools) to a very small handful. I think more than anything we need students to become good problem solvers. Math offers a good vehicle for that but so can other subjects. 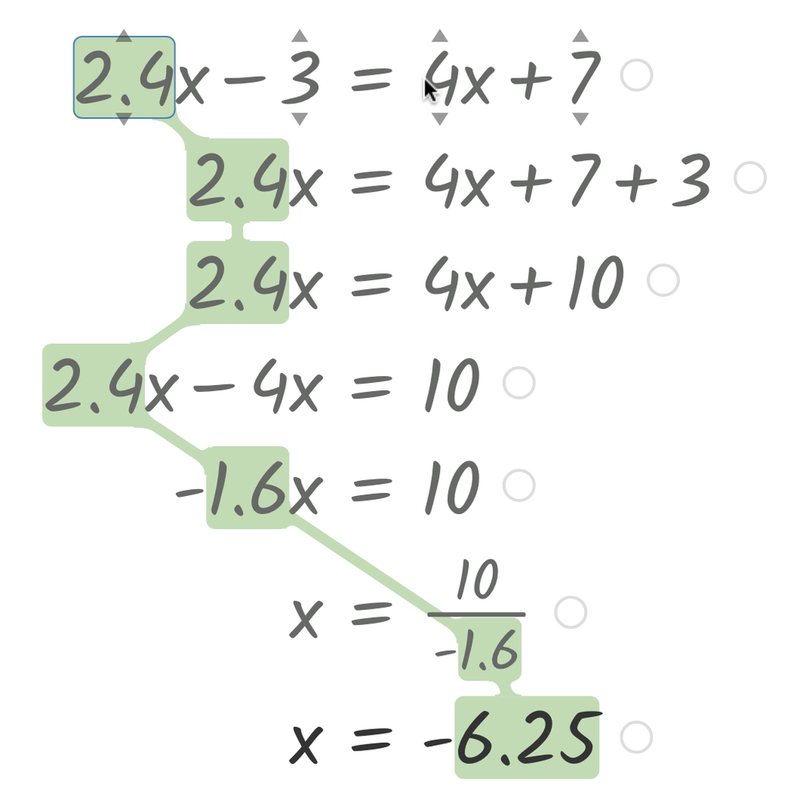 So, yup, maybe Graspable isn’t really useful for teaching students how to solve equations (and may even reinforce poor rules) but maybe this now allows us to focus on some other aspect of math that might be better for students to learn. As I have wrote on twitter, I am thinking of how this can be used to support, for example, my seniors next year who are behind their peers a year (or more) in math, who should be taking algebra 2, but would get CRUSHED in that class (after having “learned” all the solving equations tricks and they still don’t get it). I am also thinking of this as a way to support those students who may be working under a math-specific IEP. I see this tool as a supporting tool. I am not convinced on how it can be used a teaching tool. I do think it could help students with bad algebra experiences make sense of things that have not made sense for them. Interesting. Though I wonder if we reserve something like this for our struggling students and students with IEPs, could we be doing harm by reinforcing the idea (which they may already hold) that math is about arbitrary symbolic manipulations? I’m also concerned that giving this perpetuates a pattern where certain groups of students are regularly exposed to ways of doing math that fail to engage them in deep mathematical exploration. Then again, I suppose this all depends on how you implement this technology. It’s hard to talk about tech in isolation from the context in which it’s used. @Melvin. I never wrote or meant to suggest that GM be reserved for struggling students or students on math IEPs. But the more I play with GM, the more I think it would be an appropriate support for those students…or any student for that matter. My seniors who are a year behind have already have this idea that mathematics is just arbitrary symbol manipulation. I think GM could be used in an action/consequence manner to (perhaps) helps these kids make sense of something that has not made sense to them before. I am still feeling out how this tool can be used. I was immediately kind of amazed by the slickness, I admit. I thought of one student who has pretty serious reading and writing disabilities. Writing, even steps in math, for them is extremely laborious. The cognitive load takes over all of the thinking around what they are doing. I can see this being a cool tool for them to be able to do some of the math while short circuiting some of the labor of writing. But it certainly short circuits some of the thinking, too. I will have to be cautious about when to introduce it if we choose to use it. I can also see it being useful in supporting things like deriving the quadratic formula, which is very symbolically difficult for some students, even if the concept makes sense. This is “just” pushing symbols around, which is definitely not what I want my algebra class to be about. But it is something that shows up in my state standards and exams, so I can’t just ignore it, either. There’s another newish tech tool, casios class pad. I’m not sure where that fits in my current ti/desmos/other tech mosh pit. I see value in the symbolic/graphical connections you can make. It has a seamless interface with a GeoGebra graphing window. Check it out at https://youtu.be/DfC9K_jKP0E. Yeah, the GeoGebra integration is really nice. I’m used to dragging sliders to see a function change and I liked dragging the numbers themselves. It removes a layer of abstraction. If you are using this to solve equations, what makes this better than paper and pencil? Knowing how to do the process is a necessary skill and understanding the ‘properties of equality’ is important at the Algebra 1 level. I’ve never seen the drag across. Aren’t we supposed to stop using the “tricks” and working towards conceptual understanding? I can see a lot of reteaching or undoing. The research says kids retain more with paper pencil anyway. I’d rather see it make mistakes and see if students can spot them and make sense of them. I think that is true for many if not most students. But there are some students for whom the writing is a major impediment. And making an error can become an almost insurmountable obstacle to fix, especially early in a skill. I can see a tool like this being helpful, there. I never teach to “pass actos”, but for some reason, there is always (at least) one student that brings that trick to the classroom. He heard it from a sibling, his parents or another teacher. Maybe this technological tool could help the student see why it is NOT a good idea. It actually shows that dividing by the coefficient affects all the terms, but it is not allowed to subtract a term before the distributive property is used, for example. 2(x-5) should “pass” the -5 as a positive 10. What does the manipulation of the symbols in solving a simple linear equation such as ax+b=c add to understanding the mathematics that underlies the procedures? How does it help a student make sense of the problem and its solution? This approach with graspable fails to connect many concepts either through its process or a visualization. It could make sense in a problem. Example: I had x dollars and my mom gave me five more. Now I have eight. How much did I have before adding five, well, five less. I can solve problems undoing the operations, but taking care of the order. You can see all the identities being used, you can control the order of operations, you can SEE the division as a fraction. When I use it next year, which I can’t wait to do, that’s how I’m going to instruct my students to show their steps. We agree about the “E”–we tried it without, and you run into all kinds of weird situations (how do you raise both sides to a power? How do you distinguish multiplying on the left and right? Many of our younger students really didn’t like the idea of just writing 2* and leaving it blank). We’re not in a perfect place yet–Suggestions very welcome! (Disclosure: I’m a founder of GM, and of Algebra Touch). Tools like GM and Algebra By Hand(TM) (https://www.algebrabyhand.com/teacherFAQ#infoVideo) are useful for teaching ADVANCED PROCEDURAL FLUENCY in algebra by reducing the students’ cognitive load. They do NOT assist with conceptual understanding. Advanced procedural fluency (APF) is the ability to manipulate algebraic equations by moving terms and factors in your head. Every STEM professional possesses APF. Students need APF before moving on to calculus. In the US, we have always forced our students to learn it on their own. Why not teach it to them AFTER they have acquired conceptual understanding? These tools can be used to do this while reducing teachers’ workload. THIS is what technology SHOULD be used for in the classroom. Algebra By Hand is a great project, and I agree that it could potentially help build procedural fluency! We hope Graspable Math can do the same. One difference, that is both a strength and a caution, is that GM is a more open space, which means that students can also explore properties of equations and derivations, modify them, combine them with other representations (like graphs or geometric structures), and so on. That means that there are lots of interesting ways to use GM to do things that go beyond procedural fluency. http://www.kurtsoeser.at/2018/06/14/graspable-math/ has a great example of this kind of thinking (in German). Thanks, David. I LOVE GM and have been advertising it to math teachers at regional NCTM meetings because it is the BEST smart board tool for algebraic manipulations – and it’s FREE! I admit that I made an over-simplification that tools like GM and ABH do not assist with conceptual understanding. In examples like the demonstration you reference, it does ASSIST with conceptual understanding, however, only in the sense that it removes the bookkeeping and arithmetic chores from algebra so that students can focus on higher concepts. Desmos does this as well. We need to be careful that teachers don’t use tools like GM and ABH to SKIP OVER the concept of applying equivalent arithmetic operations to both sides of an equation. I am so happy to see these public discussions and get this great feedback. I think Dan has a great comment about the TIME required for teachers to learn how to use these tools. As I expect that these tools will become more commonplace, it makes me think that one way our industry can be of service to teachers would be to adopt some “standards” for gestures across the tools, so teachers would not need to learn different gestures for different tools. Do you think this is too ambitious? It might require third-party interface design experts, and instructional designers to drive to a standard. And David is mostly correct when he wrote that I helped create Algebra By Hand™. Actually, it’s more accurate to say that I created Algebra By Hand. Every line of code. I did it as a labor of love for the minority students that I was volunteer tutoring. I wanted to give them the gift of advanced procedural fluency to improve their accuracy, increase their speed, and boost their confidence when doing simple algebra. I realized that other teachers might want to do the same, so I’ve published the work to make it available to others. So I think GM and ABH have very compatible objectives. Hi Michael, Good to hear from you! I actually think it’s a great idea! Erik Weitnauer and I have just been kicking around the idea of a sort of ‘meeting of the minds’ of people who have developed gestural algebras. I think a standard might be premature (and hard to enforce! ), but I agree that some some discussions about what we think works well and works poorly might help us all align a little, and that might help teachers with the learning curve. We’ll be in touch! I would like to drag the 2x over to subtract from the 4x (or vice versa), but I can only drag the 2 individually or the x individually. (I don’t think 2=4 + 10/x is the most helpful? Oh, I can move the 4 in front of the x so it says x*4 now instead of 4x. Still not helpful.) How do you keep going? Dan, this is a great article that affirms the process my colleague and I use for assessing edtech in our school division. We plan to use it as a model for teachers and tech coaches, with attribution, of course – thanks! Oh interesting. I don’t spend nearly enough time digging into the TOS but I’m glad you’re watching out for the teachers and students you support. Thanks for the comment. I featured it in the main post. My Month Teaching Summer School & The Curse of Content Knowledge	The Desmos Teaching Faculty Is Hiring!